Vipers SC player during a previous match in Kampala. Courtesy Photo/Vipers SC. Uganda’s Premier League side Vipers Sports Club have qualified for the first round of the 2017 Total CAF Confederations Cup. After a goalless first leg last weekend, Vipers battled to hold home side Club Volcan De Moroni from Comoros 1-1 on Saturday at the Stade de Moroni. They qualify for the next round second on an away goal rule. The home side took the lead after 15 minutes with a Kamal Djabir goal that caught the Vipers SC defenders napping. 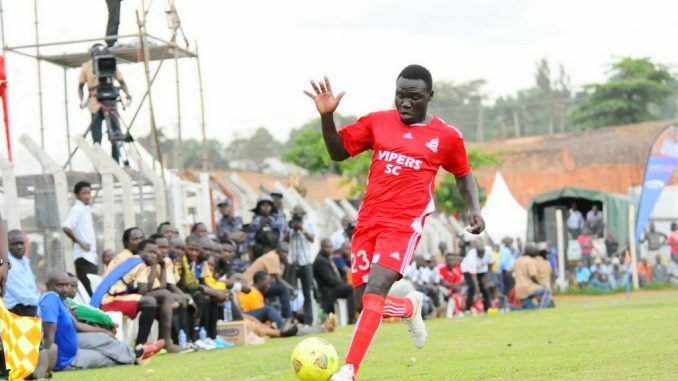 But Vipers SC who preferred to rest their leading marksman Tony Odur continue to push forward on the artificial turf before Deus Bukenya converted a free kick after 29 minutes to level matters. It was a cautious second half as both teams played more defensively but occasionally went forward. Not even the presence of Cameroonian born Noah Stephane together with two players from Madagascar Razafy Andre and Andrianomenjanaharyangelot Aristide could help the Comoros team. “We are happy we have made it to the next round,” Vipers SC coach Richard Wasswa told the media in Comoros. Vipers SC will now face the winner between Mozambique’s Uniao do Songo and Platinium Stars of South Africa. Platinium Stars won the first leg 1-0.